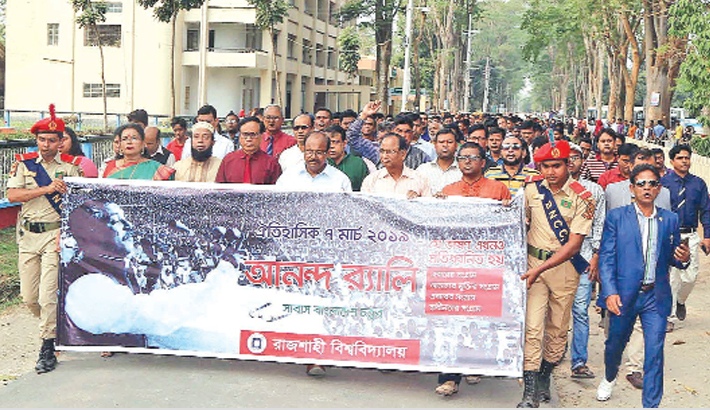 Different organisations and bodies organise different programmes marking the historic 7th March Speech of Father of the Nation Bangabandhu Sheikh Mujibur Rahman, on Thursday in their respective areas. 1) Teachers, students and employees of Rajshahi University bring out a procession on the campus. 2) Khagrachhari district Awami League and its associate bodies take out a procession in the district town. 3) Deputy Commissioner of Dinajpur Md Mahmudul Alam distributes new clothes among students. 4) Teachers, students and employees of Mawlana Bhashani Science and Technology University take out a procession on the campus.